Mushrooms may be delicious, but you don’t necessarily want them growing out of your kitchen cabinets. Not to worry though, because rather than a troubling sign of massive renovations to come, these mushrooms are meant to be welcomed into your house. 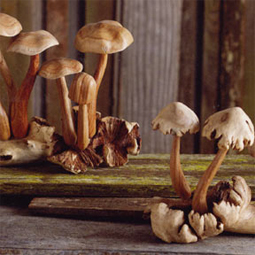 Available in four different variations measuring up to 11.5-inches in length, these Roost Carved Wooden Mushrooms add an organic earthiness to your kitchen décor without ruining the woodwork.